How does the photographer navigate our new national order? As debates about the economic future of the United States continue into a controversial presidential administration, the spring issue of Aperture magazine offers an urgent reflection on photography, labor, and community. In their work across the country, from the factory workers of Pennsylvania to refugees resettled in the heartland, the photographers featured in “American Destiny” are bound by a desire to reveal how lives are shaped by the ebb and flow of the economy. “American Destiny” features LaToya Ruby Frazier and Kellie Jones on the enduring images of the civil rights movement; Katy Grannan on the communities of California’s Highway 99; Rebecca Bengal on activist Chauncey Hare‘s 1970s chronicle of American workers; Brian Wallis on the union hall agitator Fred Lonidier; plus contributions and portfolios by Garnette Cadogan, David Campany, Sandra Cisneros, Carolyn Drake, Jim Goldberg & Donovan Wylie, Gregory Halpern, Kathya Maria Landeros, Mark Neville, Alessandra Sanguinetti, Brian Sholis, Stanley Wolukau-Wanambwa, and much more. Use #AmericanDestiny to join the conversation on Twitter, Instagram, and Facebook. 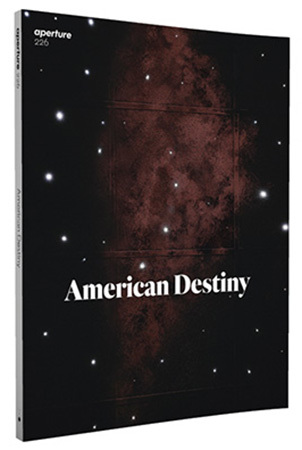 Subscribe now to receive “American Destiny” and more great issues.